"OK, here we go," says National Public Radio host Marian McPartland, in that jaunty English accent so familiar to Saturday-afternoon jazz fans. McPartland is sitting at a grand piano, in a spacious, sixth-floor recording studio in midtown Manhattan, taping her Peabody Award-winning show, "Piano Jazz." Sitting next to her, at another grand piano with the lid propped open at the same angle, is Seattle pianist Dave Peck. "Dave Peck is a pianist and composer who possesses great musicality, a sensitive touch and a lively sense of swing," says the grand dame of the airwaves. "I first heard him play when he was a teenager." So begins a dramatic moment in Peck's career, part of a blitzkrieg of promotion and productivity that may finally nudge a longtime local favorite onto the national stage. Peck, 50, a deeply romantic player with musical bloodlines that flow back to Bill Evans and Keith Jarrett, is one of the few Seattle musicians ever to appear on McPartland's show, which airs on more than 200 stations. This week, Peck also releases a new CD, "Good Road," at a three-day engagement at Tula's, in Seattle's Belltown. Later this month, he launches a new page on ArtistShare (www.artistshare.com), an innovative Web site getting a huge buzz in the jazz world. Says Seattle jazz radio host Jim Wilke of "Piano Jazz": "It's kind of a mark of having arrived, to be recognized by her." McPartland met Peck at a summer jazz camp at the University of Washington when he was 14. Raised in Berkeley, Calif., Puerto Rico and, finally, Oregon, Peck moved to Seattle in 1977, where he became a regular sideman, backing up Chet Baker, Freddie Hubbard and others at the old Pioneer Square club Parnell's. Peck also started teaching at Cornish College, where he remains an associate professor. His career has had its ups and downs, but in 1998, Peck began releasing a stream of quality CDs. 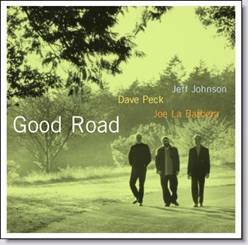 "Good Road" is his fifth, the second featuring bassist Jeff Johnson and Los Angeles drummer Joe LaBarbera, who played in Evans' last trio.